1. NAME The name of the Association is the JOHANNESBURG ATTORNEYS ASSOCIATION. 2. OFFICES The offices of the Association shall be in Johannesburg. to engage the Association in legal proceedings in any capacity which the committee may deem necessary so as to advance, protect, uphold or develop the objects and interests of the Association and/or the interests of its members. Attorneys practising in the Johannesburg area and any attorney, wherever his/her office may be situated in the Gauteng area, whose practice required attendance in the Johannesburg area. (As amended at the Annual General Meeting on 20 September 1995). Attorneys employed by such attorneys. Clerks serving articles of clerkship with such attorneys. An annual subscription, the amount of which shall be determined by the Committee with due consideration to the rate of inflation an to the requirements of the Association, and of which notice shall be given to members before the end of April each year, shall be paid by each member except those who are serving articles of clerkship. (As amended at Extraordinary General Meeting of 12 April 1994). The financial year of the Association shall commence on the 1st day of June of each year and subscriptions shall be due and payable on such date. The affairs of the Association shall be managed by a committee of twelve, all of whom shall be elected from those members referred to in Rule 4(a) and 4(b) and the Annual General Meeting of the Association or any other General Meeting specially called for such purpose. Each committee member shall hold office for a two year period, but the retiring members shall be eligible for re-election. (As amended at Annual Meeting of 23 October 2003). (i) At the first meeting following the every year’s Annual General Meeting, the Committee shall elect a Chairman, Vice-Chairman, Secretary and Treasurer, provided that no member of the Committee shall hold office as Chairman for more than three consecutive years, if any of these offices shall become vacant between elections, the Committee shall be entitled to fill the vacancy. (ii) All existing office-bearers and sub-committee members shall hold office until the formal appointments are made at the first committee meeting after the Annual General Meeting. All nominations for the Committee shall be in writing and shall be forwarded, with the nominee’s acceptance, to the Secretary not less than twenty-one days before the date of the Annual General Meeting and the names of the persons nominated shall be notified to members not less than fourteen days before the date of the meeting. (As amended at the Annual General Meeting of 7 November 2002). In the event of any vacancy or vacancies occurring on the Committee the remaining members of the Committee shall have the power to fill any such vacancy or vacancies. The member so elected shall hold office on the same terms as the member whose place he takes and shall serve only until the next Annual General Meeting. The Committee shall be entitled to co-opt not more than two members, who shall be members of the Association referred to in Rule 4(a) and 4(b), and who shall hold office on the same terms as the other members of the Committee and shall serve only until the next Annual General Meeting. At a committee meeting five members shall be required to form a quorum. Any member who misses 3 (three) consecutive meetings of the Committee, without leave of absence, shall automatically be disqualified from office and the Committee shall be entitled to replace such member in terms of Rule 6(d). Any member attending less than 50% (fifty per cent) of Committee meetings from the date of election to the next Annual General Meeting, without prior leave of absence from the Committee, shall not be eligible to stand again for re-election to the Committee in the following year. (As amended at General Meeting of 15 October 1998). The composition of the Committee shall be limited to no more than 2 (two) representatives of any one law firm. In the event of a law firm nominating more than two persons for election to the Committee, then only the two candidates who receive the most votes, in a contested election, will be eligible for membership of the Committee and, in the event of an uncontested election, the new Committee of the Association will, on a basis of votes, elect which two members of that firm take their place on the Committee. (As amended at General Meeting of 3 November 2004). to review the annual subscription payable in terms of clause 5 of the Constitution, from time to time, the Committee being empowered at its discretion to increase the subscriptions as it deems fit, due regard being given to the rate of inflation and the requirements of the Association. (As amended at Extraordinary Meeting on 12 April 1994). The Committee shall have full power and authority at any time to call Special Meetings of the Association of which at least seven days notice shall be given. (As amended at the Annual General Meeting of 7 November 2002). An Annual General Meeting shall be held not later than 30 November in each and every year, at which –(i) the election of the Committee shall take place;(ii) the report of the Committee together with the Balance Sheet and Accounts shall be presented; and(iii) any other business shall be dealt with of which notice is given to members not less than fourteen days before the date of the meeting. (As amended at the Annual General Meeting of 7 November 2002). Notice convening the Annual General Meeting shall be given to members not less than 14 (fourteen) days before such meeting. A quorum of members shall be not less than 15 (fifteen) of the members referred to in Rule 4(a) and 4(b). Should there be no quorum present at any Annual or Special General Meeting, the meeting shall, subject to Rule 8(e), stand adjourned until a date to be agreed upon at such meeting (for which those present shall be a quorum) and at such resumed meeting those present shall form a quorum regardless of the number. At least seven days notice of such adjournment shall be given to members. Upon receipt of a requisition signed by not less than fifty members the Committee shall convene a Special General Meeting to consider the matters specified in the requisition. The meeting shall be upon not less than seven days notice, which shall state the purpose of the meeting, and such Special Meeting shall be held within twenty-one days from the date of receipt of the requisition. Should there be no quorum present at any such meeting, it shall be dissolved. (As amended at the Annual General Meeting of 7 November 2002). 9. DEFAULTERS Any member whose subscription shall be in arrears for a period of six months, and who shall not hereafter pay such subscription within 14 days of the posting to him of written request for payment, may be removed from the list of members by the Committee. 10. RESIGNATIONS Any member desiring to resign from the Association may do so on giving notice to the Secretary but such person shall remain liable for any subscription or subscriptions which fell due prior to the date of such resignation. Every member of the Association, not being an articled clerk, present at a meeting and not in arrears with his subscription shall have one vote. No voting by proxy shall be permitted. In the event of an equality of votes, the Chairman shall have a casting as well as a deliberative vote. The majority at any meeting may demand that voting be by ballot. In completing the voting paper for the election of the members of the Committee, a member entitled to vote shall vote for not less than six and not more than twelve of the candidates proposed for election. If a voting paper does not comply with the above it shall be disregarded. 12. LEGAL PROCEEDINGS The Association may sue or be sued in its own name in any Court of competent jurisdiction. 13. FUNCTION A function, the nature, cost and venue to be determined by the Committee in their discretion shall be held. Members who attend the function shall be required to contribute an amount to be determined by the Committee to the cost of that function. (As amended at Extraordinary General Meeting on 29 May 1990). 14. AMENDMENTS This Constitution may be amended, altered or added to at any Annual General Meeting or any General Meeting specially called for such purpose. Any such alterations or additions shall not be deemed to be passed unless approved by two-thirds of the members present at such meeting. No proposed alteration or amendment shall be considered at any meeting unless the proposed amendment or alteration has been notified to members in writing not less than fourteen days before the date of the meeting. (As amended at the Annual General Meeting of 7 November 2002). 15. LIABILITY OF MEMBERS The liability of a member for the obligations of the Association shall be limited to the amount of his unpaid subscription. 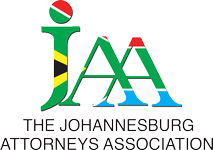 The Johannesburg Attorneys Association is an Association not for gain, and a corporate body with legal personality separate from its members, the assets and liabilities of which are separate from its members and in which no member shall ever obtain an interest, which assets shall upon dissolution not evolve upon its members but shall be donated to other associations not for gain with similar objects and interests as the Association. 17. MEANING OF JOHANNESBURG The word “Johannesburg” wherever used in this Constitution shall mean the magisterial districts of Johannesburg and Randburg. 18. NOTICES Whenever notice of any matter or thing is to be given to members it shall be deemed to have been duly given if posted or delivered to Docex or despatched by e-mail or via telefax to members at the address recorded in the Association’s offices and shall be deemed to have been received two days after the date on which such notice was posted, delivered or despatched. (As amended at General Meeting of 15 October 1998).